Some sisters go shopping, others will go out to lunch together to get that fun sister time into their schedule. But when living as missionaries in the jungle you have to just squeeze those times in every chance you get. This day would be one of those days; I could sense it was going to be delightful. I had an errand to run two villages up river and my two oldest sisters, Mary and Eva had decided to join and make it a sister outing. I was excited to say the least. Trudging through the mud and braving the creek wouldn’t be so bad if it could be considered a sister outing. After walking over half an hour through the jungle and past the first village we got to the creek. Thankfully that day the water was low and someone had placed a bamboo over it so that you could hopefully balance your way across the twenty-four-foot span without taking a swim. Don’t get me wrong, I love swimming, and after walking through the mud for thirty minutes it can actually be refreshing. But the nut so fun part is then having to walk in heavy wet jeans the rest of the way. Thankfully we all made it across the bamboo safely with only one of us taking a dive. Twenty more minutes of mud and we arrived at our destination. The business we had come to see after was taken care of rather quickly; so after buying each of us a little snack, I took my sisters to see the newest development in the community. Sitting down on the new bridge to eat our snacks under the cool shade of the nearby mango tree, I shared with my sisters the story of the bridge we now sat on. The sidewalks had been there but the bridge had been missing; and so for years everyone passing through had to get off the sidewalk and go through the mud hole across sticks and logs they had put in place, to get to the next section of sidewalk. It was a huge inconvenience, especially at harvest time as the heavy bags of rice and beans were all carried this way. But a few months earlier the ministry had donated enough gas and nails to build a bridge. The community pitched in and each family sold a few pounds of beans to pay someone with a chainsaw to cut the lumber, then coming together for a community workday they had erected this sturdy much needed bridge. They had put their time and effort in and it had been worth it: They constantly thanked us hardily making sure we knew that they appreciated the help that had been provided through the ministry. Our conversation soon drifted to other aspects of ministry and what God had been teaching us each individually, but all to soon the sun began rotating its way westward, breaking up our conversation and encouraging us to make the trek back home. We took it slow, playing around at and taking photos at the huge tree where the path went right underneath and between the roots, but eventually we found ourselves again at the little creek hoping to make it across the little bamboo without going in. Someone had moved the little makeshift bridge to a little different place causing it to be at a slant. Not taking note of this I accepted the pole cut by our friend Makin who had caught up with us on the trail, and attempted my crossing. The bamboo being at a slant I took only a few steps before plunging into the water. “No big deal,” I thought to myself, “I’ll just have to walk home in soggy clothes.” Our friend Makin cut another pole ensuring that the rest wouldn’t join me and all made it across without incident. I swam to the other side, but as I got out of the water I realized I was missing something: When plunging into the water “with little grace” my half sized machete had been flung out of its sheath on my side. Makin joined in the search, but half an hour later after finding nothing I told him we should give up and go home. Not willing to give up yet Makin made one last dive into the water and came up with a big smile on his face and my machete in his hand. “How did you manage to find it?” I asked him. “There was still one place I hadn’t looked,” he said handing the machete to me. I thanked him numerous times and he assured me it wasn’t any trouble. “What would we do without our friend Makin?” I asked Eva with a wink as we watched the old man walk off. In our first encounter with this strange man we had nicknamed him Angel Man; since that day many things had changed, but our friend never quit his many acts of kindness toward us. A few months later I found myself again at this location wanting to cross the creek, but this time I didn’t have to worry that I would fall into the creek. The two communities had joined together and put a large log across the creek spanning from one bank to the other. Excited I assumed this bridge would surely last as it was high above the water and wouldn’t be washed away by the rising of the creek. But my hopes were dashed as only a week later the bridge had been washed away when the water had risen, and I had to swim across the creek with my heavy jeans and boots. The two communities had tried their best, but their efforts had failed. The sick and elderly once again wouldn’t be able to cross to get to the closest clinic. The wheels in my head began turning: Something could be done. 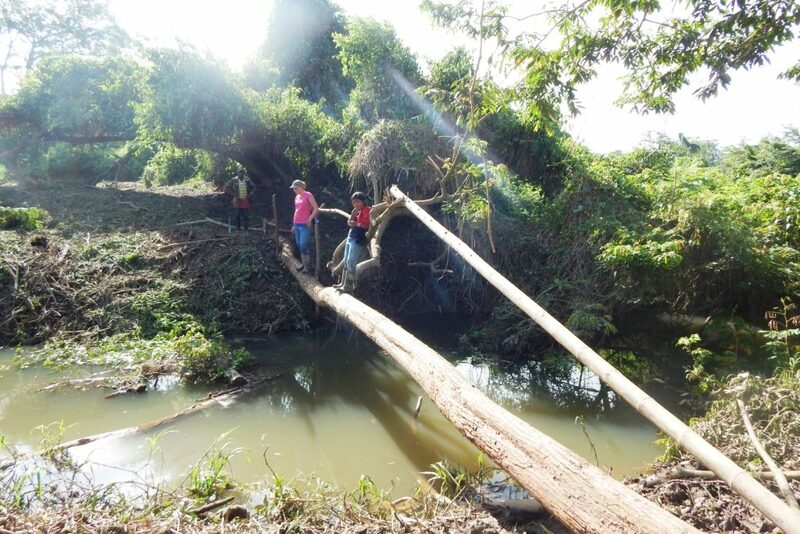 Both villages had shown interest in making the situation better and would surely be willing to put their time into building a bridge if materials could be supplied. So after much thought we are considering building a 120 feet cement and cable bridge that wouldn’t wash away when the creek rises. If anyone is interested in helping fund supplies for this bridge you can contact us for more information.